Friends and relations of artists are quite used to hearing, “Sorry, I need to spend time in the studio this week.” If we work at home and they’re so bold as to drop in without a call first, they expect to see us at the easel or table, brush or some other tool in hand, working like demons on the latest project. “I thought you were busy with your painting this week.” And we are. Busy thinking, day dreaming, relaxing our brains enough to allow new ideas to come in. Busy doing anything but painting. The old saw that good ideas come while we’re in the shower is true because standing in the shower is as good a place as any to do absolutely nothing except let the water pour over us. The perfect environment for inspiration. Poet Naomi Shihab Nye wrote a beautiful message for us all on this very subject. Bill Moyers said this poem changed his life. Maybe it will change yours. I know for sure, it will help you explain your downtime as a creative soul. Time runs only one way. Decide for yourself what to do with the time you have, especially the time you need to be bored and quiet while inspiration comes. Wash the dishes. Go fishing. Stare at the sea. It matters. Molly, You will find inspiration everywhere around you; the moon, stars, clouds……grocery shopping, ads on the community board. 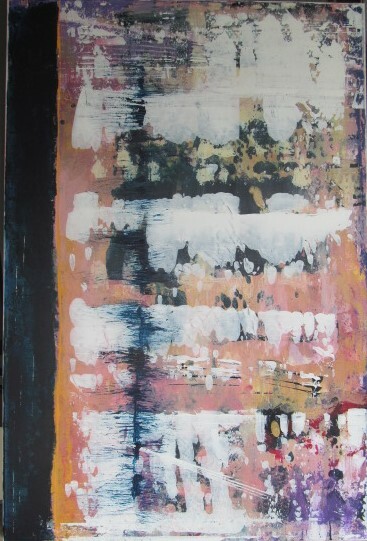 You are so good at seeing what others do not…..keep up your abstracts……love your work!